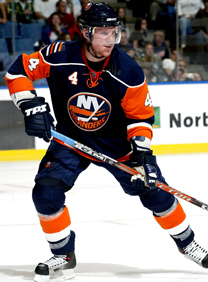 Bryan Berard, the 1996-97 Calder Trophy winner as NHL rookie of the year as a member of the Islanders, has signed a one-year contract with the Islanders. The 30-year old Berard earned his spot with the Islanders with a successful showing as an invitee to training camp. Said Snow, the Islanders’ general manager: "The credit goes to Bryan for coming to camp with the right attitude and proving himself. He is a very highly-skilled defenseman. He wanted to be an Islander again and we’re thrilled that he is." Berard played the last two seasons in Columbus, where he was coached by Gerard Gallant, a new member of Nolan’s staff for 2007-08. Besides his Calder Trophy season with the Islanders, Berard’s best year was in 2003-04 when he was 13-34-47 in just 58 games with the Chicago Blackhawks. In 565 career NHL games with the Islanders, Toronto, Rangers, Boston, Chicago and Columbus, Berard has 71 goals and 230 assists for 301 points. The native of Woonsocket, Rhode Island was the first selection overall in the 1995 NHL draft by the Ottawa Senators and was traded to the Islanders in January, 1996 for Wade Redden. Behind an 8-goal, 40-assist season with the Islanders, Berard edged out Jarome Iginla for the Calder Trophy in 1996-97. He was a member of Team USA at the 1998 Winter Olympics. In 2000, his career endured a major setback when he was clipped in the right eye by a Marian Hossa stick during a game between Toronto and Ottawa. Determined to return to the game, Berard underwent seven surgeries to improve his vision to meet NHL standards. Berard received the Masterton Trophy in 2004 for his perseverance and dedication to the game. Click here and search "BERARD" for exclusive interviews with the Islanders defenseman.